MANILA –Five hundred kilometers north of the capital, awaits a delectable food trip where I indulged myself into—the filling meriendas of the North. Coming from Manila, you’ll first pass-by the town of Currimao, Ilocos Norte. 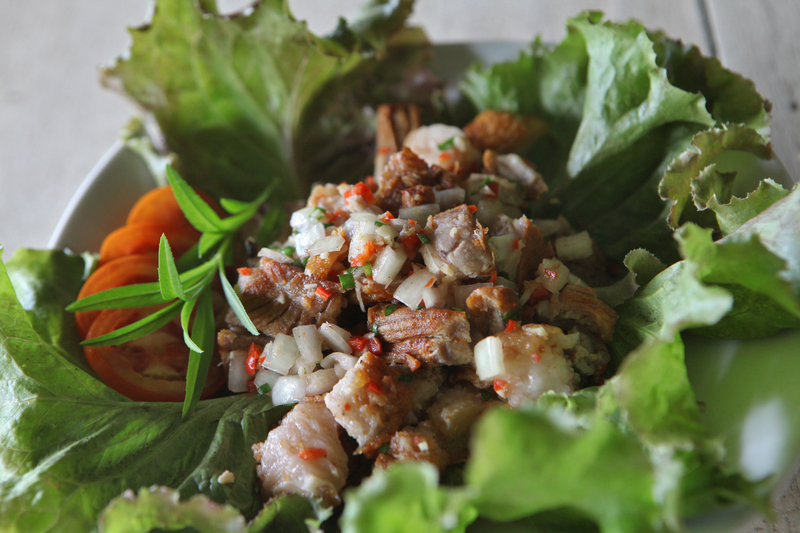 Odd as it may the name sound, this quiet own is a perfect place to kick-off your Ilocos Norte food trip. Located just along the national highway, Irynn’s Native Delicacies sell tasty rice cakes which easily become a favourite merienda for both local and tourists. Instead of the usual grill, the family-owned business use a large wood-fired oven or pugon for their freshly baked Special Tupig and Bibingka. When pulled-off from the pugon, popping sound from the toasted upper layer of Tupig wrapped in banana leaf cheered for our cravings that afternoon. “We specifically use Acacia wood from Pagudpud for our pugon, this ensures the consistency of heat and aroma in our products.” said owner Arcenia Suga. The Special Tupig which she formulated 40 years ago become a hit with its sweet and smokey taste that blends well with its toasted crust and chewy inner texture—its melted cheese and coconut strips mix. The store also sells special bibingka— flavoured rice cake with coconut milk topped with diced nuts. Deliveries can be arranged and customers are advised to booked their orders 3 days ahead the delivery date. From the day of its purchase, the special delicacy can last up to three days but I think a kakanin this good would’t even last for a day in your dinner table. Honestly, I had three before we left. Special Tupig sells at Php 10.00 or a quarter of a dollar while the Bibingka sells at Php 50.00 or a dollar each. 15 minutes drive from Currimao is the town of Batac, tagged as the “Home of Great Leaders” this spot was the birthplace of the late former President Ferdinand Marcos. They kept his memorabilia at Marcos Museum and Mausoleum—where the glass-entombed preserved remain of the former President can be found. Hungry from the tour at the Museum, one could kick-off an afternoon snack at Batac Riverside Empanadaan where line of stalls that sells freshly cooked empanadas can be found. The most famous of them is Glory’s Empanada, which placed Batac Empanada in the culinary map of the Philippines. Founded by Gloria Aduana Cocson, the stall currently attracts both local and foreign tourist that includes Batac on their list. 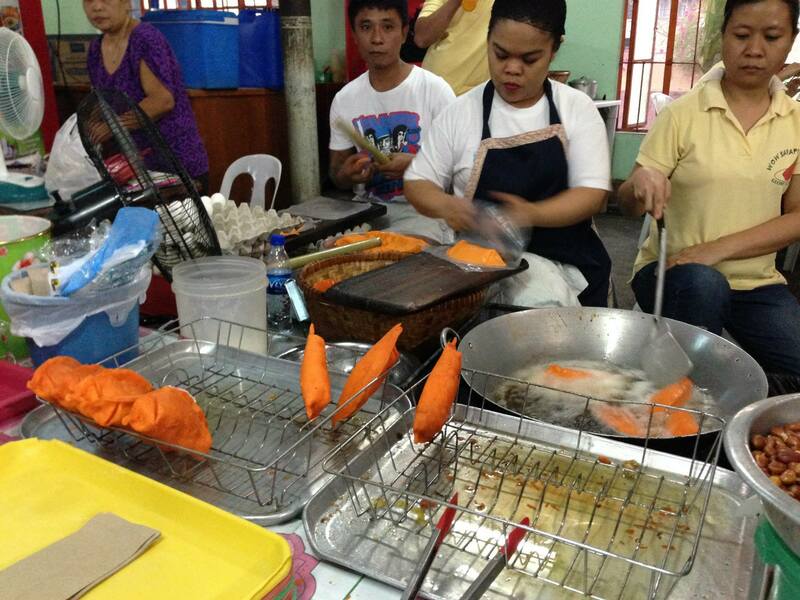 The orange coloured empanada has a mixture of papaya strips, egg, Ilocos longganisa and bean sprouts, wrapped into a flour dough then deep-fried for 3-5 minutes. Adding Sukang Iloko makes a very interesting combination to the taste of the filling. It sells from Php 35.00 or half a dollar depending on your preferred filling sizes. 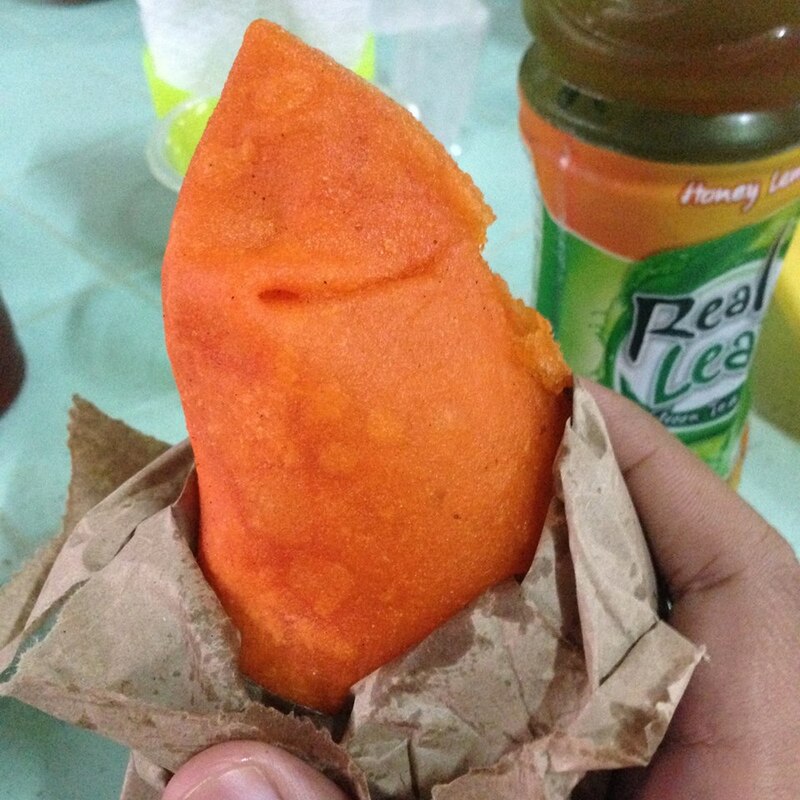 Every 23rd of June, Batac held the Empanada festival to celebrate its famed orange afternoon snack. It’s an undeniable fact that each province in the Philippines has their own version of sweet munchies rice cakes that are usually made with coconut strips and milk. In Ilocos Norte, they have their own version of Palitaw, which they call Tinudok— a rice cake slowly cooked in boiling water, garnished with coconut strips and sugar then served in a barbecue stick. Linapet and Latik — sticky rice cake is also a must try. Going light is Busi — pop sticky rice cooked in coconut milk can be an alternative to these heavy snacks. Packed with the calories you need for extra energy, a good two hours drive from Laoag City will take you to the towns of Burgos and Pagudpud where wide white sand beaches and beautiful rock formations can be found. It’s also famed for its windmills and the scenic trek to Cape Bojedor lighthouse, while a new trend in Pagudpud will delight the calorie conscious travellers. Kapuluan Vista Resort in Pagudpud is known for it’s surfing activities and sumptuous meals. 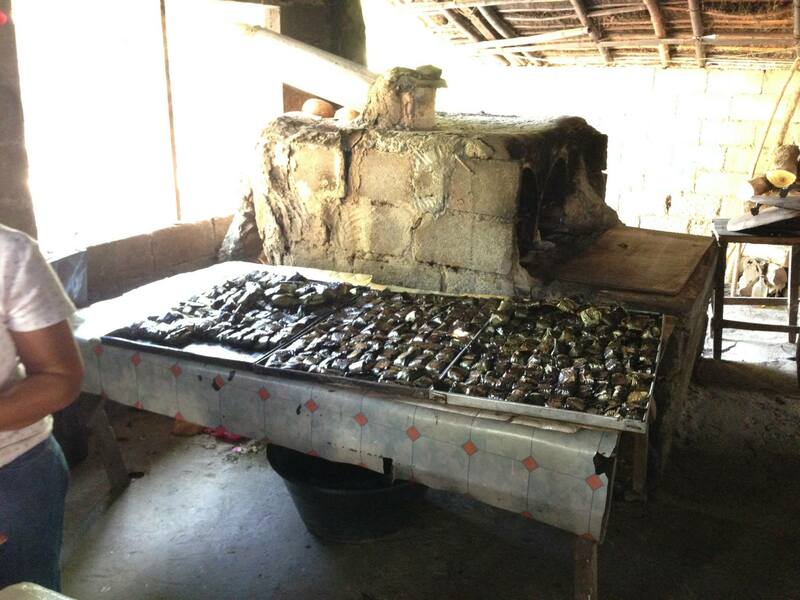 The resort also pioneered sustainable farming that inspired other resorts in the area. Some of the special dish that they offer are the tasty Malberry Salad, Eggless Leche Flan and Pesto Quesadilla Rolls which all the ingredients are 100% organic and non-GMO. That—all that— are low in calories. Sunsets till stargazing in Ilocos are one of the picturesque that I have seen and having these meriendas on your side compliments the billion star-sky experience.